Asian elephants have smaller ears. African elephants have bigger ears. What kind of elephant has rainbow-striped ears in cuddly microfleece? Beeposh elephants, of course. Sally's striped ears coordinate with the zany flowers on her bright-pink belly for a bold, girly look that's full of pizzazz. 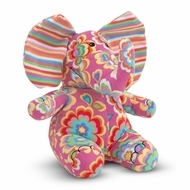 With a super-soft, squeezable body and a winning smile tucked beneath her upturned trunk, this pink pachyderm has tons of lovable personality.